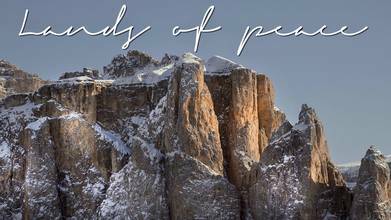 Description: A cinematic aerial drone video of the Dolomites (Dolomiti) filmed in different seasons. The cinematic footage is shot in 6K Ultra HD resolution with a DJI Zenmuse X7 Raw ProRes camera and an Inspire 2 drone. This nature video features sunrises, sunset footage, Winter, Autumn and Spring captured in the gorgeous Dolomiti mountains. The Dolomites well deserve to be in the UNESCO's list of World Heritage Sites. It's a mesmerizing, ancient and mystical location, where you can enjoy nature at its best. It is one of those places that makes you understand why Italy is such a famous place for tourism. The Dolomites are part of Unesco's World Heritage Sites. The Dolomites (Italian: Dolomiti are a mountain range located in northeastern Italy. They form a part of the Southern Limestone Alps and extend from the River Adige in the west to the Piave Valley (Pieve di Cadore) in the east. The northern and southern borders are defined by the Puster Valley and the Sugana Valley (Italian: Valsugana). The Dolomites are nearly equally shared between the provinces of Belluno, South Tyrol and Trentino. There are also mountain groups of similar geological structure that spread over the River Piave to the east – Dolomiti d'Oltrepiave; and far away over the Adige River to the west – Dolomiti di Brenta (Western Dolomites). There is also another smaller group called Piccole Dolomiti (Little Dolomites) located between the provinces of Trentino, Verona and Vicenza (see map). The Dolomiti Bellunesi National Park and many other regional parks are located in the Dolomites. The Dolomiti is a World Heritage Site! The site of the Dolomites comprises a mountain range in the northern Italian Alps, numbering 18 peaks which rise to above 3,000 metres and cover 141,903 ha. It features some of the most beautiful mountain landscapes anywhere, with vertical walls, sheer cliffs and a high density of narrow, deep and long valleys. A serial property of nine areas that present a diversity of spectacular landscapes of international significance for geomorphology marked by steeples, pinnacles and rock walls, the site also contains glacial landforms and karst systems. It is characterized by dynamic processes with frequent landslides, floods and avalanches. The property also features one of the best examples of the preservation of Mesozoic carbonate platform systems, with fossil records. The nine components of The Dolomites World Heritage property protect a series of highly distinctive mountain landscapes that are of exceptional natural beauty. Their dramatic vertical and pale colored peaks in a variety of distinctive sculptural forms is extraordinary in a global context. This property also contains an internationally important combination of earth science values. The quantity and concentration of highly varied limestone formations is extraordinary in a global context, whilst the superbly exposed geology provides an insight into the recovery of marine life in the Triassic period, after the greatest extinction event recorded in the history of life on Earth. The sublime, monumental and colorful landscapes of the Dolomites have also long attracted hosts of travelers and a history of scientific and artistic interpretations of its values.